An increasing number of Russians are buying and consuming illegally distilled vodka, as legally produced variants of the beverage become more expensive on account of new taxes. Legal production of vodka in Russia is falling but not because of a change in the people’s drinking habits. The problem is that an increase of excise duties has prompted the consumers to turn to counterfeit produce more and more often or to start production of liquors in their households. While previously the policy of the state brought about some encouraging results in the sphere, it is apparently making glitches this time, experts say, adding that adjustments of the excise duty strategies are obviously necessary. In June 2013, Russian distilleries bottled 40 percent less vodka than in the same month in 2012 and the overall production of the drink has dropped by almost a third since the beginning of the year. The increase of tax burdens makes it much more difficult for the producers to compete with the illegally distilled vodka, the market share of which is already assessed at 30 percent. 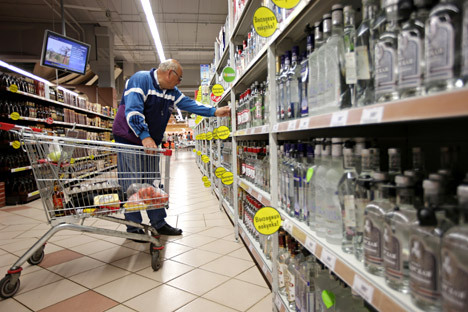 The consumers are turning down the vodkas that are legal but expensive and the situation results in a growing output of fake alcohol, with no less than 20 million Russians drinking surrogates at the moment. Experts started making warnings back in 2012 that the production of vodka in this country was about to plummet. They linked their apprehensions to a steep increase of excise duties for strong alcoholic beverages. While the duty stood at 254 roubles per liter of absolute alcohol at the beginning of 2012, it rose to 400 roubles - or by 57.4 percent - in January 2013 and will make a further climb to 500 roubles as of January 1, 2014. As for the minimum retail price per bottle of vodka, it has risen to 170 rubles per standard 0.5 litre bottle from the 125 rouble mark registered January 1. The growth figures are as much impressive as they are unprecedented. Nothing of the kind was seen in previous years, with the exception of 2001 when the excise duty was also hiked by 40 percent and the legal market of vodka shrank in the same manner. One more blow was dealt to the producers by a full ban on selling liquors at the so-called ‘movable trading facilities’ - in kiosks and temporary trading pavilions. The bottom line is that now the expert predictions speak of a 20 percent to 25 percent drop in the production of vodka at the yearend instead of the previously expected 10 percent. “I’ll be quite pleased if the figure doesn’t exceed 20 percent in the final run,” Kommersant quotes Andrei Strelets, the owner of the Siberian Beverage Group. “What we see now is a rapid shrinkage of the market and what is going to happen next year when the excise duties grow again is simply inconceivable,” says Dmitry Dobrov, the president of the Association of Alcoholic Beverages Producers. On the face of it, everyone acknowledges the achievements that the government has scored in recent years in terms of legalizing the market of liquors. The steps taken from 2009 through to 2012 helped slash the illegal market of beverages by a factor of almost two, but now the high excise duties are fuelling a reverse tendency. According to Sergei Kleshchukov, the director general of Organic Vodka Group, the shrinkage of the market simply means illegalization of some of its segments because no radical changes have occurred in the consumption of alcohol. “The fall in the lowest price segment will continue next year,” he said. On the face of it, the Russians are displaying a growing demand for household distilleries and hooch stills, tradesmen in several specialized stores told the Rossiyskaya Gazeta daily. The rank-and-file consumers are thus killing two birds with one stone - they find an alternative to the progressively more expensive vodka and protect themselves against surrogates. The sales of these devices have jumped fivefold over the past twelve months, says Yevgeny Demidov, an executive at an Internet store selling the accessories for homemade alcohol. Production of alcohol at private households in Russia stands at no less than 250 million litres a year. The prime cost of a litre of hooch does not exceed 40 roubles and that is why moonshining appears to be a lucrative business against the background of the official vodka selling for 170 per bottle. Experts say in the light of it that the only option for resolving the problem is to readjust the excise duties either by freezing them for a certain period or revising it downwards.